Tongue | Microanatomy Web Atlas | Gwen V. Childs, Ph.D.
Identify the upper surface of the tongue by its stratified squamous epithelium that has patches of cornification. The surface is irregular because of the numerous FILIFORM PAPILLAE. There may be one large CIRCUMVALLATE PAPILLA which is distinguished by its taste buds along the lateral walls. The following figures illustrate these regions. The above figure shows a circumvallate papilla. The stratified squamous epithelium is bright red. 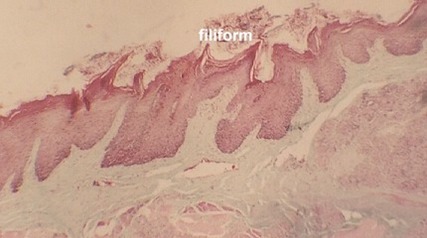 The dermis is distinguished by blue staining connective tissue. 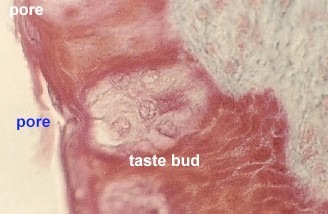 The taste buds are in clusters along the two lateral walls. Locate them in your slide (or in this photo). 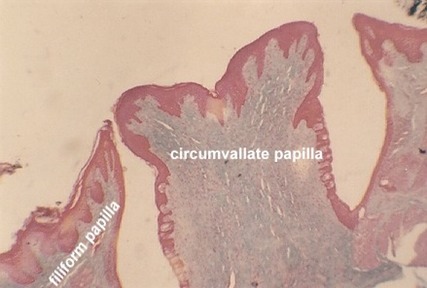 To the left of the Circumvallate papilla is a filiform papilla. 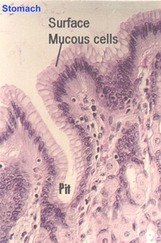 A low power view of the epithelium of tongue shows numerous spike-like filiform papillae. Note the patches of keratinization. 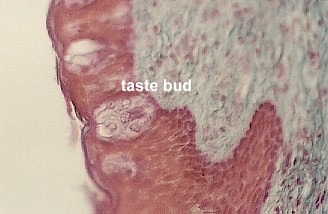 Taste buds are shown along the sides of the circumvallate papilla. The dissolved substances to be tasted are collected in a pore which is basically an invagination at the apical surface. This view of taste buds shows the pore that is formed at the apex of each cell cluster. How are taste buds organized to perform their function? 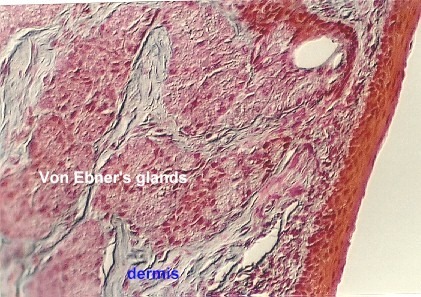 In the dermis at the base of the Circumvallate papilla, are some serous glands called Von Ebner's glands. These are considered "minor" salivary glands. 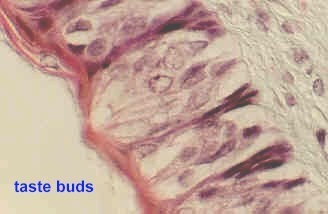 The photograph shows clusters of Von-Ebner's glands as well as a duct (note the dense epithelium). What is the function of the Von-Ebner's glands? Move deep into the tongue and note the many interlacing bundles of skeletal muscle cut in longitudinal or cross section. This provides the flexibility we need for speech. 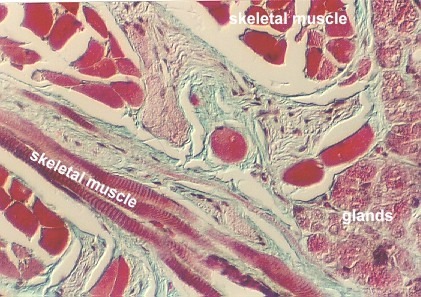 Also, scattered among the muscle fibers are clusters of mucous salivary glands. 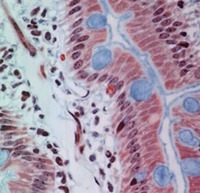 Identify the muscle and gland clusters in this or the following photograph. This view shows a higher magnification of the dermis of the tongue. 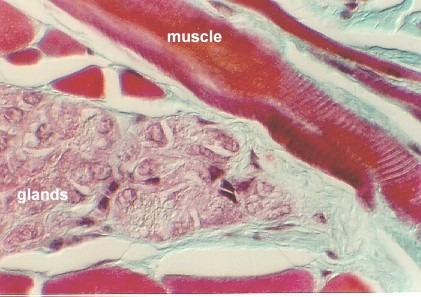 Mucous glands and striated muscle are evident. You may also find a number of peripheral nerves.